The last time I visited Kiev was back in the summer of 2010, and it was blisteringly hot, full of packs of wild dogs, gypsy cabs, and general wackiness. Landing on a plane from Budapest on ’10, we exited the aircraft directly onto the tarmac and were shuttled through a very simple terminal, into a huge sea of touts and taxi drivers, all swarming around me and the few friends I was traveling with. Not this time! As I landed from Almaty (I had flown on Air Astana, the national airline of Kazakhstan from Delhi, India to Almaty, then to Kiev), I was struck by how modern, new and clean the terminal at the airport was! Customs was completely revamped in the typical European style, and the baggage claims were new, fast, and efficient. I could tell that in the 4 years between my summer in Kiev and my present arrival in the country, things had improved quite a bit. Ukraine was obviously making efforts to modernize and improve both their airports and the rest of their capital city. 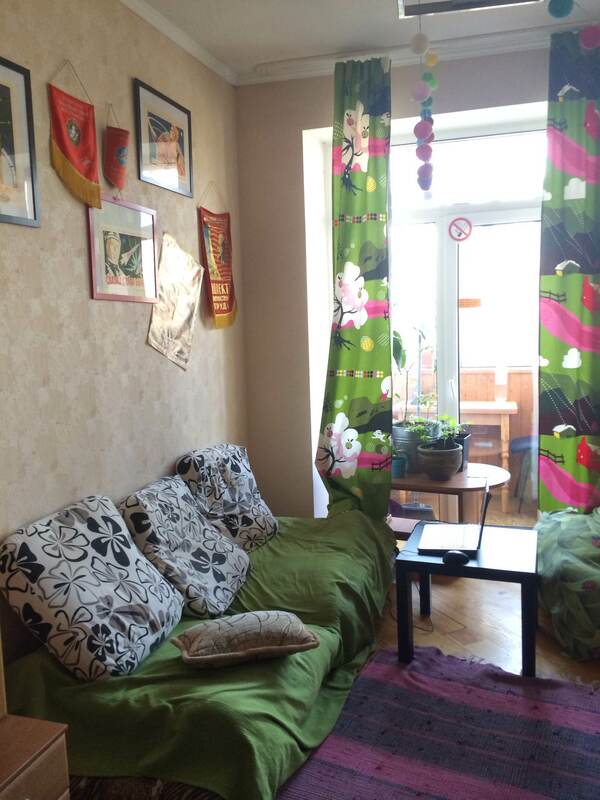 Kiev Central Station hostel, living room. A friend of mine from picked me up and took me directly to my lodgings, at Kiev Central Station hostel. I stayed there the time I visited before, and I chose to stay there again, despite not generally being a fan of “budget travel” or hostels in general. However, Kiev is a place which is very hard to navigate as an English speaker, and it’s very helpful to have a hostel full of people to join you on outings and a great owner like Aricio to assist with finding a translator and local guide. Aricio treats all of his guests like family, and despite being Brazilian, he speaks Ukrainian and can arrange anything you want, whether it be a trip to Chernobyl or a guide fluent in the local language to help you navigate the city. Back in 2010, he found a great guide for my friends and I, and it made all the difference as almost no one in Kiev speaks a word of English; the predominate languages are Ukrainian and Russian. No street signs are in English, no one knows even the most basic of English terms, and no taxi driver can read an English language map. So my advice to anyone visiting Ukraine, and Kiev in particular, is to make sure you have a translator to join you on your outings at least at first, until you get the hang of the local language. It was nice to be back at Kiev Central Station hostel, and, like the rest of Kiev, it had grown, expanded and improved since my last visit. Instead of just taking up one flat on the top floor, the hostel had expanded to another apartment on the level below it as well. The hostel is most definitely a hostel, and there are no elevators in the building, as the hostel is composed of two Soviet-era flats in a Soviet-era building. You must walk up 5 flights of stairs with all of your bags to reach the first level of the hostel. However, it is very homey, clean, and inviting and as stated, Aricio, the owner, is a fabulous host and makes you feel right at home. Because of the protests, the hostel this time around was very empty, but usually there are also tons of travelers willing to welcome you into their social groups and join you as you learn about and explore Kiev. 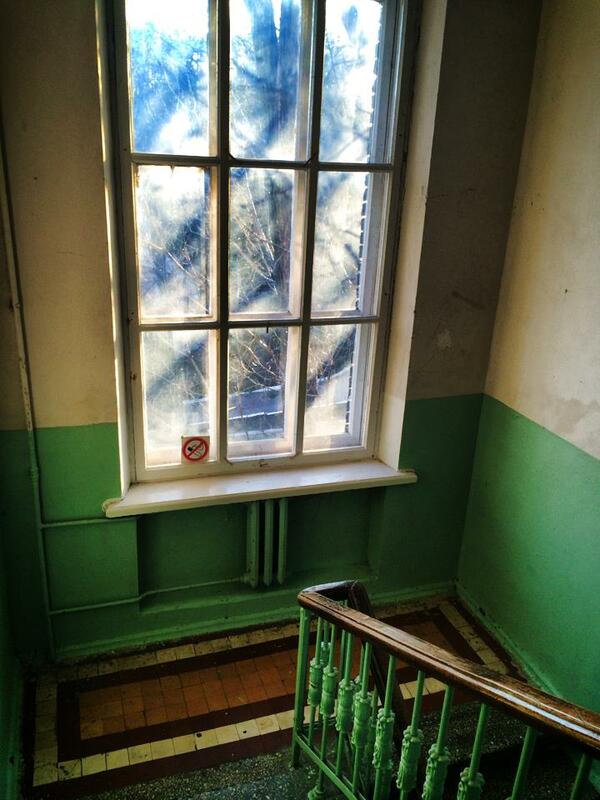 The staircase leading to the Kiev Central Station Hostel. Unfortunately for me, I was late in my arrival to Ukraine. I had missed my flight in Kiev and due to the nature of the flights between Delhi and Kiev, I ended up arriving two days later than expected. I only had a little more than 24 hrs in the city, so I had to make use of my time wisely. I arrived late at night, dropped my bags off at the hostel, and proceeded to get some dinner. I knew of a little place called Palata #6, which was a short walk across the street from the hostel, so I went over to grab some dinner. It’s a rather difficult spot to find, as it’s down a back alley and underneath an office building, in a basement, but it’s well worth the search. Waitresses dressed up like hot nurses serve a large variety of good food and drinks, for rather cheap prices. Plus, there’s non-stop MTV videos being played on the TV screens set up around the eating area, and tons of young hipsters hanging out, having fun. The place has a really nice, laid back vibe. I decided after dinner to go find a nightclub, because Ukraine knows how to party like nobody’s business, and they have some amazing house DJs. At this point it was rather late, probably 11pm-ish, and I went back to my hostel, changed into something club worthy, and ran out to the street to hail a cab. The neighborhood was much more quiet than I remember it being in 2010, which I attributed to the protests and the general lack of tourists. I didn’t see a single tourist in Kiev (besides myself) for the entire duration of my stay. The roving packs of wild dogs which had bothered me non-stop in 2010 were also nowhere to be seen, and my favorite aspect of Kiev, it’s “gypsy cabs” were also seemingly missing, which made an issue for me as I stood on the street corner hailing cab after cab, only to be turned away. “Gypsy cabs” were simply random people driving along the road who would pick you up if you hailed them down and would drive you to your destination so long as you were going in the same general direction they were, all for very cheap prices. This practice seems to have disappeared in the city, and as I took to walking in my 4″ heels to the nearby club, called the “Boom Boom Room“, I silently cursed whoever outlawed them. I had forgotten it was a Sunday evening, so low and behold, after finally getting a cab and being dropped off at the club, I was disappointed to find out it was closed. I figured I could try to find another club, but Sunday nights are always terrible in the nightclub industry, so instead I decided just to hit the Maidan in my heels and fancy outfit. The Maidan by night!to hit the Maidan in my heels and fancy outfit. I know I’ve said that you need a translator to get around the city, but I’ve been to Kiev before and I know my way around. I wouldn’t recommend that a newbie get out at midnight and hail cabs and bar hop without some knowledge of Ukrainian and Russian, but it is possible if you’ve been here before and know your way around the city and can flirt with taxi drivers to get to where you need to go. So I did just that, and got a ride from the club to the Maidan, and wandered around a bit. For anyone who is considering a trip to Kiev or to Ukraine in general, please don’t be scared by the government warnings. There is absolutely no threat to Westerners, at least not in Kiev and Lviv. 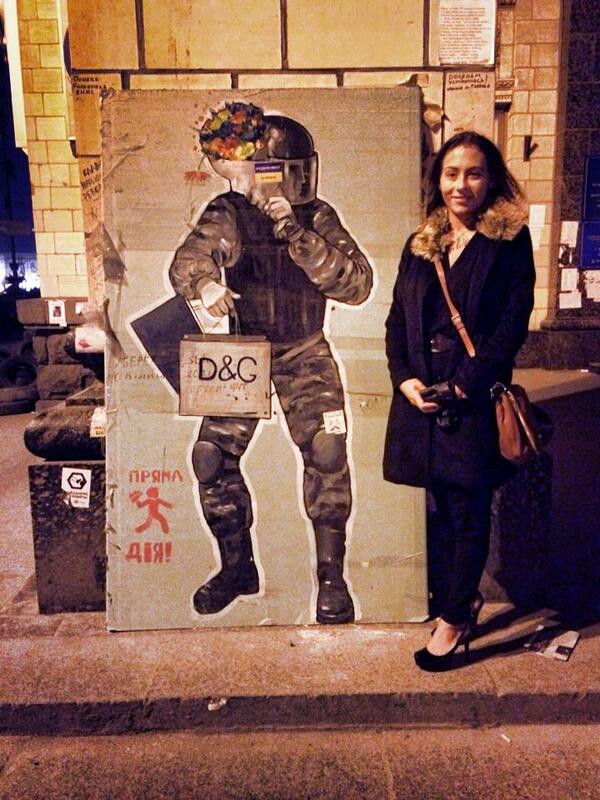 I would think twice about Crimea at the moment and parts of the deep east of Ukraine, but as I walked around the Maidan past midnight, in heels and a fancy coat, not a single feeling of being unsafe ever passed through me. 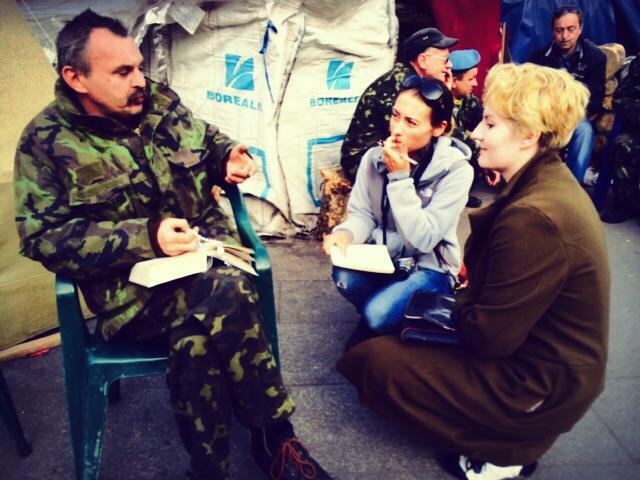 The entire time I stayed in Kiev I felt completely safe, and would not hesitate to return. In fact, I felt safer in 2014 than I did in 2010, due to a large part to the city’s effort to handle the wild dog problem and to generally clean up the streets. If one can walk around as a single woman past midnight in the middle of a massive protest camp and feel utterly safe, there is no threat to ANYONE’S safety! The street outside my hostel. helped make my tour of the Maidan easier, as I didn’t stand out as a tourist or as a Westerner. However, even if I had, I doubt there would have been any issues. Everyone there seemed friendly and open, and when I visited again the next day, they were all eager to talk, eager to get to know me, and to share their stories and their reasons for protesting. Spirits seemed high, and people were sitting around their campfires, joking, laughing, drinking and smoking. As it was my first time seeing the Maidan since 2010, it was a large shock to see how much it had changed. Bricks had been torn up and the entire place was filled with tents and encampments from all different types of people–eastern, western, and Crimean Ukrainians as well as Georgians, Azerbaijanis and Chechnyans. There were mounds of flowers and make-shift memorials for fallen protesters, as well as large mounds of bricks (pulled up from the sidewalks), candles, huge amounts of used tires and tons of old scrap wood and metal. These were piled into large barricades, which allowed the Maidan guards to have checkpoints to control who entered and left the Maidan. I wandered around for a good period of time, and then decided to head back to my hostel. I came across a musician playing a piano on a sidewalk of the Maidan, and donated some money to his cause. I then easily caught another cab back to the hostel, using my hands to tell the driver “left here, right here, ok straight” as he didn’t understand English and I didn’t have a Ukrainian map to show him how to get back to the hostel. 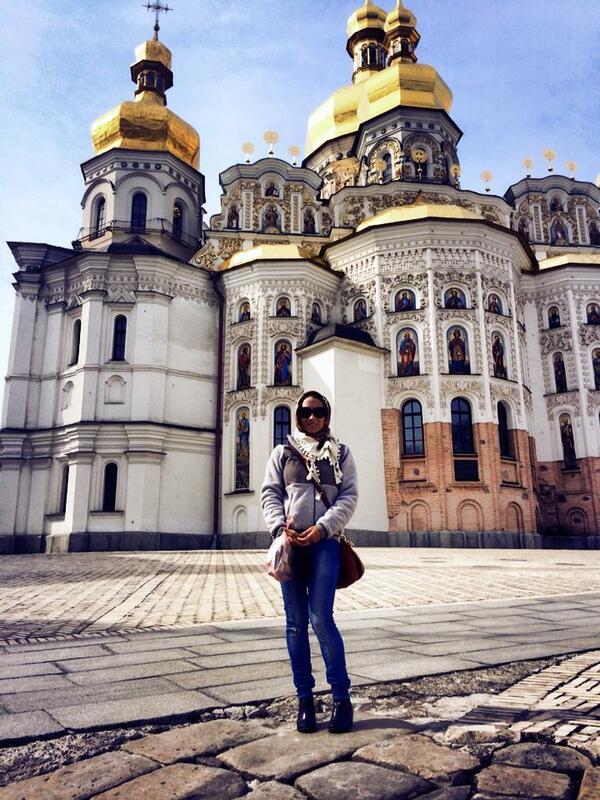 Standing in front of a church in the Lavra. 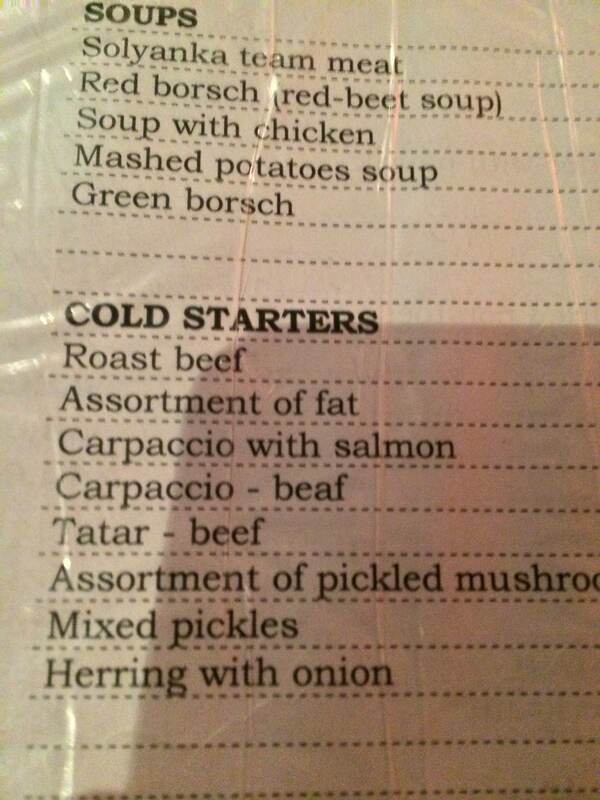 some translation work. I wanted to speak to the protesters myself, to get a better idea of what was actually going on, and what their motivations, hopes, and dreams were for their country. I also intended to write a piece about the Ukrainian protests of 2014, so I needed someone who could really do a good job translating both in language and in spirit, the sentiments that these people were trying to express. However, because I was so excited to be in Kiev, I couldn’t sleep past 7am and decided to just get up and head over to see the Lavra again before meeting with Katya, my translator. The bunk bed I slept in at the hostel was more than comfortable and I only needed a few hours of sleep, a super hot shower (of which there were plenty!) and some wifi and I was ready to hit the streets of Kiev again, this time grabbing a taxi to the Lavra. The Pechersk Lavra in Kiev is an amazing complex of Eastern Orthadox churches and monasteries, along with some museums, and a bunch of underground tunnels that house many holy relics (most are mummified bodies of ancient monks who were canonized and who are said to help provide healing miracles). The Lavra has been a cave monastery since the 1500s, and the tunnels underneath the church complex go deep into the ground. There are also full on underground churches, and services are conducted down in these tunnels several times a week. To reach the tunnels, you must pay and entry fee and there are also English speaking guides available for hire if you’d like more knowledge about what you’re looking at as you walk through the cramped, low ceilinged tunnels. Before they let you enter, you must cover your head with a scarf (if you’re a woman) and wear a long skirt (for woman) or long pants (for men). If you don’t have the appropriate clothing, they have some temporary wraps you can borrow to put over your clothing and scarves are for sale all around the Lavra grounds. In fact, the scarf must be worn as soon as you enter the Lavra grounds, not just inside the tunnels, so it’s good to bring one or to buy one before purchasing a ticket to enter the Lavra complex. Once inside the tunnels, it’s very dark and the only light is from lit candles, carried in one’s hand and candles which burn in brass candelabras places in the larger rooms of the underground complex. The tunnels are very narrow and the ground is uneven, so you must be very careful to not trip. I wouldn’t recommend that people with any sort of disability try to go down into these tunnels, and likewise, if you are claustrophobic, don’t do it. Once you’re down there, it’s easy to get lost as well, so I would definitely recommend spending the 400 Hryvnia ($36) for a guide. You must also be careful not to let your candle catch fire to anything, as it’s just a wax stick with the wick lit, and you are not offered any sort of candle holder. However, for all of these warnings–if you can go down and see the holy relics, GO. They consist of mummified bodies of the monks who built these tunnels by hand, slowly but surely digging out meter after meter of underground tunnels to isolate themselves in in their quest to serve God. These bodies are naturally mummified (unlike the ones in Egypt) and in the old days, they considered this natural mummification a miracle and hence considered the bodies to be holy relics, touched by God. Some of these people were also renowned healers of their times and a prayer or two to them is said to help with health ailments. All of these bodies are housed in class coffins, and while you can’t see much except a mummified hand here or there, the cloths that they are draped in are embroidered with the finest gold and silver threads, and have many jewels and other beautiful personal adornments on their bodies. After touring the tunnels at the Lavra, I visited some of the magnificent golden-domed cathedrals on the grounds, as well as some the museums. The museums cost a little extra to enter, but are well worth it, especially the micro-miniature museum, which is filled with the tiniest works of art you’ll ever see. The cathedrals are all gold gilt and soaring ceilings covered in the most beautiful paintings, and they surround a lovely clock tower. 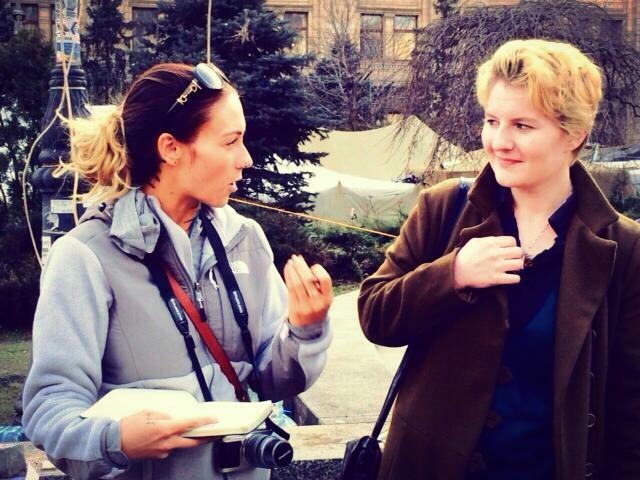 Katya and I, interviewing people on the Maidan. Once 11:30am rolled around, I had to leave to meet up with my guide. We had decided to meet at the Arsenala metro station, which happens to be the deepest metro station in the world (it was a Soviet era bomb shelter as well), and a short walk from the Lavra. Once we met up, we grabbed some coffee and proceeded to commence on a “revolutionary walking tour” of the city. On the way to the Maidan, she pointed out certain government buildings, told stories of street corner skirmishes, and, since she had taken part in the protests herself, she was able to give a very thoughtful, in depth explanation of what had happened, and why. Katya was an amazing guide and I was thankful to have had her insight while traversing the main thoroughfares of the revolution. Talking to Gvar about the protests. have appeared near cemeteries in Kiev. Katya also told of the “revolution of dignity”, as most of the protesters are now calling the February clashes. She explained that, at first, the protests had been political. People had gathered to voice their opinions about how to modernize Ukraine and their desire to join the EU. They were pragmatic about the whole thing, and didn’t figure that the protests would immediately change anything, but yet felt that their voices did need to be heard. They were initially hoping to start the process of joining the EU, and wanted to voice their support for this. However, once the violence started, the protests became less about politics and more about human dignity–to stand up for their right to be treated like human beings, and not to be shot at, disparaged, or “disappeared”. It was very touching to hear her talk about the protests, and I could tell from the size and scope of the encampments on the Maidan that the true heart and soul of the Ukrainian people had sparked and stood behind these protests. One cannot be so passionate only about politics–it was obvious that these were people fighting for their basic human right to the pursuit of happiness. 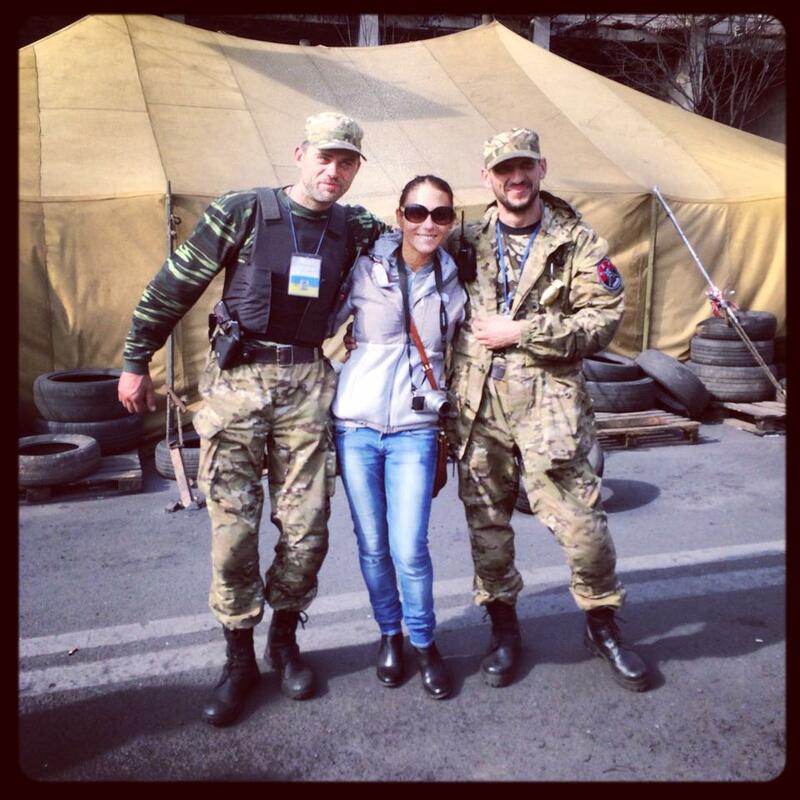 Hanging with the Maidan guards! We had a quick lunch in a local cafeteria after wandering around, looking at the homemade catapults, the makeshift stands displaying the bullets that were fired on protesters, and all the various graffiti art that covered the square. After lunch, I got to talk to a lot of protesters in the camps and got some good insight into what their goals were. I was surprised and the breadth of countries represented on the Maidan–it was not just Ukrainians protesting but people from all over the former Eastern Bloc. Citizens from nearby countries, some of whom had also faced Russian forces and invasions, had traveled all the way from their homelands to help support the Ukrainian cause. In addition, Ukrainians from all over the country were there–from the east, west, south, central and Crimea. It was not just Kievians and Western Ukrainians fighting for a more modern, less corrupt state. All of Ukraine was on the Maidan, and it was a beautiful and inspiring sight to see. After the last interviews and photos, around 5pm, I said goodbye to Katya, and took a cab back to my hostel, passing the Kiev Opera House along the way home. My flight left the next morning at 6am, so I had a quick dinner at a middle eastern restaurant near my hostel, and went to bed. At 3am sharp, as requested, a taxi came by the hostel, grabbed me and my luggage, and whisked me to the airport, where a Lufthansa jet took me to Frankfurt, and then on home to LA. All in all, while my visit was short, it was inspiring, heart breaking, and amazing. I urge everyone to visit Ukraine and to show support for their cause. Do not listen to the US State Department warnings, which are overblown most of the time anyways. If you stay in the the north and west part of Ukraine, you will be just fine. Ukraine has a lot of unique historical sites, as well as a very friendly and welcoming populace, a thriving backpacking culture and yummy food–be sure to try their cherry dumplings with sour cream, sprinkled with rock sugar. Brilliant! To see: Kiev Pecherska Lavra, a UNESCO World Heritage site– Adults, 50 UAH/Students, children and pensioners, 25 UAH. English language tours of the tunnels under the Lavra, 400 UAH for up to two people (prices increase as group size increases). Entrance is free on the last Monday of every month. 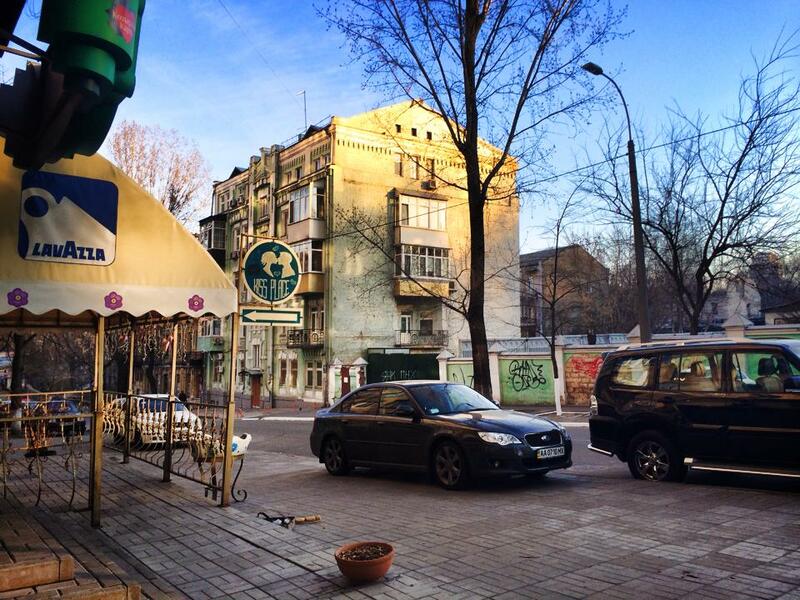 To stay: Kiev Central Station Hostel. Private twin room for 2 people (bunk beds) runs about 15 EURO a night. A four bed dorm is 12 EURO a night, and the cheapest beds are in a 12 person mixed dorm for about 9 EURO a night. Aricio is the owner of the hostel and can arrange for airport pick ups, tours of Chernobyl and local translators, fixers, and guides. All rooms have wi-fi coverage. Beds are clean and comfy, showers run hot water, and the whole vibe of the place is very positive and backpacker friendly. To party: The Boom Boom Room. Local DJs spinning house and EDM. Closed Sundays. To get there: Air Astana, national airline of Kazakhstan. I was quite impressed by how nice this airline was. Their food was really good, and they had a full meal service (including hot towels) as well as amenity kits even for economy passengers. Their layover facilities in Almaty were very nice, and their lounges were also well stocked and friendly. Also, Lufthansa runs flights to Kiev from other parts of Europe, and while I flew on Lufthansa only because it’s a United Airways codeshare partner, they generally have pretty good service, despite not being vegetarian friendly and having a rather maze-like airport layout in their Frankfurt hub. However, their business lounges are quite nice and their business seats go fully flat on their Frankfurt/LA flights. To Listen: Songs of revolution! “Eight Full Hours of Sleep” by Against Me!